The unbroken line of the Zurmang Gharwang Lineage Tulkus begins in the 14th century with the great siddha Trung Mase, the first Gharwang Tulku and founder of the Zurmang Kagyu tradition and Zurmang Monastery. He was identified by the Fifth Gyalwa Karmapa, Deshin Shegpa as the omniscient emanation of the Indian mahasiddha Tilopa. This was the fulfillment of Tilopa’s prediction made after he received teachings directly from Vajrayogini in the Western land of Uddiyana, in which he had pledged to return to spread these teachings widely, after they had been transmitted through thirteen successive lineage holders. 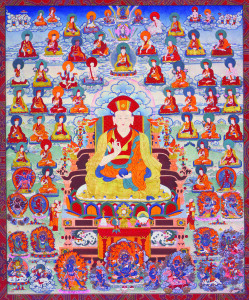 Before Tilopa’s return this set of teachings was to be limited to a one to one transmission from each lineage holder to the next, and only upon Tilopa’s later emanation as the first Gharwang Tulku were they opened up to a larger audience. These teachings form the core of the Zurmang Ear Whispered Lineage (zur mang snyan rgyud) also known as the Dakini Ear Whispered Lineage (mkha ‘gro snyan rgyud). In particular, the special transmission of the profound and vast instructions of ripening and liberation of the Dakpo Hearing Lineage fell to the Zurmang Kagyu and it continues unbroken up to the present.